To generate a new premium cigar line for the Garcia family, son Jaime Pepín created the My Father Le Bijou 1922 to honor of his father Don “Pepín” García who was born in 1922. French for "The Jewel," Le Bijou cigars are full-bodied in strength, and hand-rolled individually in Nicaragua using a rich flavored Nicaraguan Habano Oscuro tobacco leaf for its wrapper with perfectly aged blends of fillers and binders from the regions of Nicaragua. 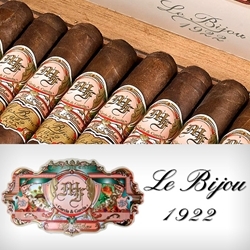 Smokers Discounts believes you'll really enjoy My Father Le Bijou 1922 premium cigars. They are a unique Cuban-style smoke that make an excellent choice for any cigar connoisseur. Stock up your humidors with these masterpiece hand-made cigars. We’ve made it easy and affordable to buy cigars online. A variety of sizes and flavors are listed below. Each of these styles are in stock and available for a low discount price! Call us for more details!